My son Dylan and I slipped out last week for a few hours of sunset paddling. It was his first time paddling in the winter, so I hooked him up with some paddling gloves and a spray skirt. Okmulgee Lake was calm and beautiful from our warm and bright 3:30pm launch until our chilly 6pm return. Despite the unseasonably warm 72 degree weather, we saw more Osprey than fishermen! This Saturday's forecast calls for more 70 degree temps and you know what that means...more winter kayaking! Since there are also likely to be gusty winds, river kayaking is preferable to lake kayaking. Some of the Oklahoma Flatwater Paddlers are planning on doing some kayaking around OKC. Dianne and I have been discussing kayaking on the Deep Fork River just off Highway 266 between Dewar and Grayson, Oklahoma. I don't expect any current, but this part of the Deep Fork River is deep enough to maintain a decent level for kayaking even during dry seasons. This spot also offers great parking and easy access to the water via boat ramp! I hope all of my paddling friends out there got some cool kayaking gear for Christmas. I got a black kayaking t-shirt and some neoprene cold water paddling pants, shirt and even kayaking socks! Having the right gear certainly makes winter paddling more fun. I'm trying to talk Dianne into a trip to Caddo Lake in February for some Texas paddling. I foolishly choose Valentines Day for our wedding, so now I can rarely get reservations to take her out to celebrate it. I figure Texas is likely to be a bit warmer in February and if not... we can always go bowling! Dianne thinks we should probably stay closer to home in Tulsa or OKC, just in case the weather gets icy. Planning winter road trips can be risky if you have to make reservations. Got any tips? I've ALWAYS wanted to go kayaking...any advice for those of us who have never done it before? The best way to start kayaking is to rent a recreational kayak and get on the water. Here in Oklahoma, that has traditionally meant an Illinois River float trip. However, new options are opening up all the time. 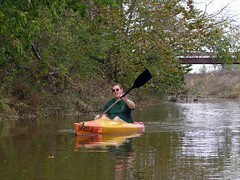 Broken Bow, Oklahoma and OKC both offer rental kayaking these days. You may want to wait until warmer weather, January paddling can be real unforgiving of errors. To National Transport who always wanted to start kayaking, why don't you buy a guide and then go to some kind of kayaking schools?